BLOOD BANKING, 1. 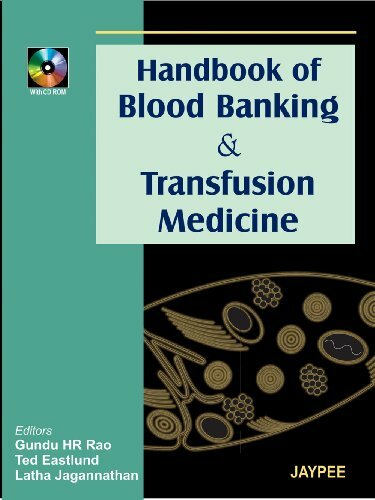 Transfusion Medicine of Today and the Future, 2. WHO Initiatives on Safe Blood Programs in the Developing Countries, 3. Organization and Operation of a Regional Blood Transfusion Center in India, 4. Blood Donor Suitability and Donation Complications, 5. Leukoreduction of Blood Components, 6. Platelets in Health and Disease, 7. Recent Advances in Platelet Preservation and Testing, 8. The HLA System and Transfusion Medicine, 9. Transfusion-associated Graft-vs-Host Disease, CLINICAL USE OF BLOOD COMPONENTS, 10. Blood Component Administration and Initial Management of Transfusion Reactions, 11. Blood Component Transfusion Guidelines for Transfusing Physicians, 12. Transfusions in Critically Ill Patients, 13. Blood Transfusion in the Operating Room, 14. Massive Transfusions, 15. Transfusion Therapy for Hemoglobinopathies, 16. Hemorrhagic Disorders in the Surgical Patient, 17. Thrombotic Disorders in the Surgical Patient, 18. Plasma Transfusion Therapy, 19. Use of Cryoprecipitate, 20. Coagulation Therapy in Hemophilia, HEMATOPOIETIC STEM CELL TRANSPLANTATION, 21. Hematopoietic Stem Cell Transplantation for Malignant Diseases, 22. Unrelated Donor Stem Cell Transplantation: The Role of the National Marrow Donor Program, 23. Umbilical Cord Blood Banking, 24. Hematopoietic Stem Cell Processing, 25. Infusion of Hematopoietic Stem Cells, 26. Bone Marrow Transplantation: Procedures and Practices in a Developing Country.